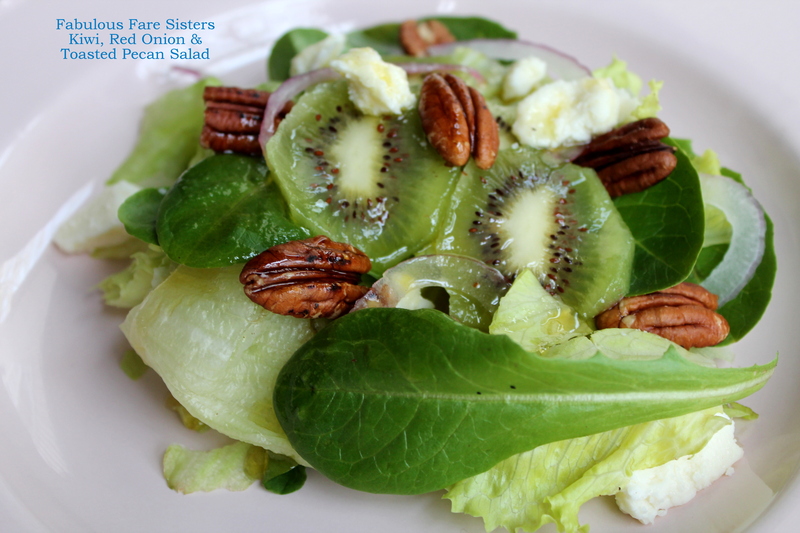 This is a quick and easy salad using fresh Kiwi and toasted pecans. Drizzled on top is a deliciously light Honey & Pear-Infused Balsamic Vinaigrette. The perfect salad for Spring! 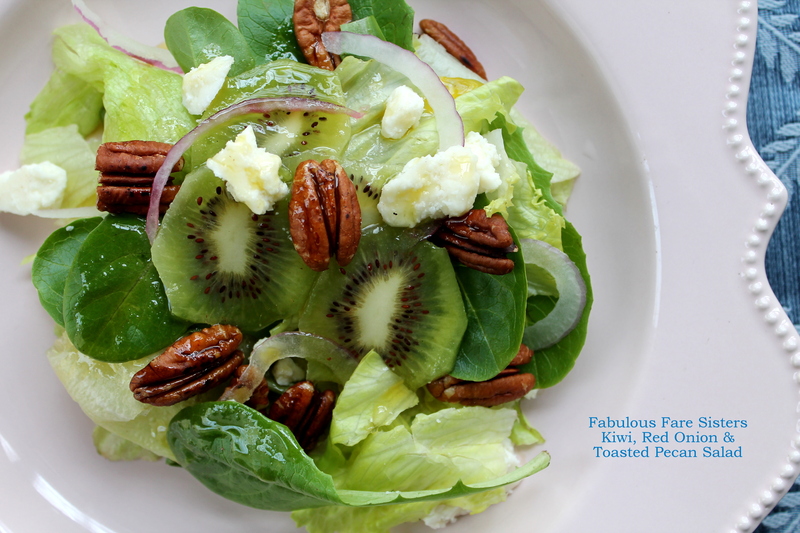 Place 1 1/2 cups mixed salad greens, a quarter of the sliced kiwi, some sliced red onion and toasted pecans and sprinkle with a few feta cheese crumbles on each plate. Prepare the Honey & Pear-Infused Balsamic Vinaigrette: In a small jar combine the vinegar, honey, salt, pepper and olive oil. Put a lid on and shake vigorously. Drizzle on each salad plate. This recipe has been shared on The Pin Junkie, Throwback Thursday, Senior Salon and Tickle My Tastebuds Tuesdays along with Weekend Potluck, Foodie FriDIY, Fiesta Friday and Funtastic Friday…Go check it out and see some other really great recipes and decorating ideas! This looks stunning. I have never seen kiwi in a salad before but it sounds delicious! What a lovely salad and that dressing sounds divine~Looks delish and thanks for sharing on Throwback Thursday! Looks amazing Linda! I adore infused balsamics and olive oils! This looks great. I’ve never tried kiwis in a salad before; will definitely have to try. Thanks for linking up with Funtastic Friday. Looks so perfect and refreshing Linda! Yum! I never put kiwis on my salad, but this flavor combination sounds so enticing! And, your pictures are gorgeous. Thanks for sharing at FF, and have a marvelous weekend! Linda this sounds so good! I love kiwi, I’ve never had it on salad! Perfect! That salad looks refreshing, I’m loving the pecans and kiwifruits in it 😋😋 Btw, Linda, just a reminder that you’ll be cohosting FF120 (May 20). I hope you still remember, lol. Oh boy, that looks so SPRINGY! I would love this salad, thanks Linda~! Oh yeah this is def spring right here! Green spring on a plate! Beautiful salad…just what I fancy! Linda what a pretty salad! I love the combination of flavors. I have not tried kiwi with feta cheese. It sounds so yummy! 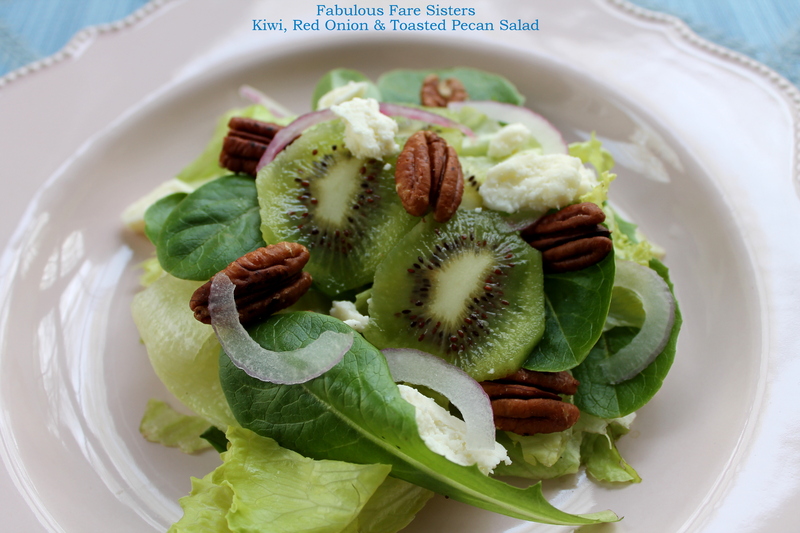 I never eat kiwi in salads…but am sure going to now…yum!!! I love mixing fruit with salad – it adds an extra dimension. You always come up with a lovely post every time! Yummm!! !